New York entrepreneur and creative force behind acclaimed US custom home furnishings company DESIRON, Frank Carfaro has always had a passion for beautiful design and artisanal craftsmanship. And when he first discovered EcoSmart Fire, he knew his design values were very much aligned. “I’ve always been driven to produce stylish pieces of furniture and refuse to sacrifice functionality or quality for an aesthetic end,” Frank explains. “Many companies make functional items and many companies can conceptualise cutting edge design: marrying the two in a way that makes sense, however, is rare. 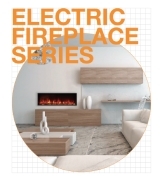 EcoSmart Fire definitely shares that same sensibility." The DESIRON collection contains over 200 standard items, with each piece being made-to-order for the client. During the process, customers personalize the products with DESIRON’s vast palette of wood and metal finishes and textiles, making each piece unique. 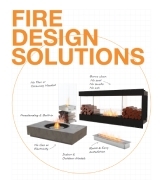 After seeing EcoSmart Fire at a tradeshow in New York, and reading about the product on a number of design blogs, Desiron now showcases a range of EcoSmart Fires in its Lexington Avenue showroom. 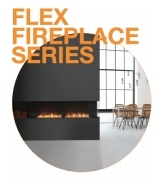 “We couldn’t believe that a freestanding fireplace solution hadn’t gotten more traction in the NYC metro area, and have found it to be a perfect fit for our clientele,” explains Frank. 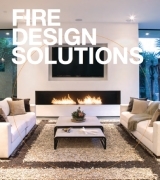 Fluid design An EcoSmart Fire feature was therefore a natural choice for Frank when embarking on a major renovation of his own Greenwich Village apartment. Being continually inspired by nature and light, Frank wanted to include an open area in the wall between the master bedroom and the living room to create a sense of fluidity between the walls. A stainless steel EcoSmart Firebox 900DB with its unique see-through element was the perfect solution, and the fireplace is now the focal point of the living area. It has been perfectly incorporated with the Black Walnut wall and cabinetry. “Specifically, the wall that features the EcoSmart Fire had to serve multiple purposes while maintaining a design that exuded the handsome yet utilitarian design concept,” Frank explains. The living room side features a meticulously designed wall unit of bookshelves and storage, which showcase Frank’s favourite books, prized treasures from his travels, and photos of family and friends. The bedroom side of the wall is kept simple, with artwork hung on a custom Venetian plaster wall. “The EcoSmart Fire is truly the centrepiece of the living area and captures my mantra of functional objects being well designed,” Frank says. “I really wanted to create a space that would make me feel like I was coming home to a boutique hotel every night after a long day. I didn’t, however, want to compromise on atmosphere. “The living area is designed to be a place where friends and family gather, cook and linger – and the fireplace promotes that type of atmosphere.